A new poll in Utah shows Donald Trump and Hillary Clinton tied while third party candidates make up more than a third of the vote. 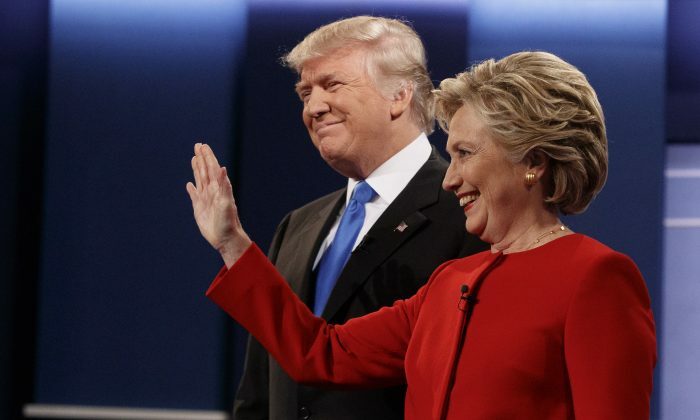 The Y2 Analytics poll released on Oct. 12 shows Trump and Clinton both getting the support of 26 percent of registered Utah voters, and third party candidates making up more than 35 percent of the vote. Former CIA counterterrorism operative and Independent candidate Evan McMullin got the support of 22 percent of Utahns, and Libertarian Gary Johnson got 14 percent support. “A third-party candidate could win Utah as Utahns settle on one,” said Quin Monson, Y2 Analytics founding partner, in a statement. Y2 Analytics surveyed 500 likely Utah voters over landlines and cellphones Oct. 10-11. The poll has a plus or minus 4.4 percent margin of error and a C+ rating by the polling website FiveThirtyEight.com. While far from perfect, the poll does signal that the Republican candidate may have a hard time winning the state that former Republican presidential candidate Mitt Romney easily won in 2012. Romney won the state with 72 percent of the vote, compared to 24 percent won by President Barack Obama. Romney has refused to support Trump and, as early as March, called Trump unfit for office and a danger for the nation and the Republican party. On Wednesday, the same day as the poll was released, The Salt Lake Tribune, the largest circulated daily newspaper in Salt Lake City, endorsed Hillary Clinton for president after calling on Trump to withdraw his nomination. Trump’s drop in Utah—a state where 6 out of 10 people identify themselves as Mormon—came after the release of a 2005 recording in which the Republican candidate can be heard making lewd comments about women. In addition, the poll shows that 94 percent of Utahns have seen the video, and a majority of Utahns want Trump to withdraw as the Republican party’s nominee. Republican lawmakers in Utah have been at the center of the moral protest against Trump, with Governor Gary Herbert and Senator Jason Chaffetz (R-Ut.) pulling their endorsements for Trump after the video was released. “Donald Trump’s statements are beyond offensive & despicable. While I cannot vote for Hillary Clinton, I will not vote for Trump,” wrote Herbert in a tweet. Chaffetz echoed Herbert’s concerns in an interview saying that he “can not support in any way, shape or form the comments or approach” that Trump has taken, adding that he wants “someone of high moral values” to be president. In addition, former Utah Governor Jon Huntsman, Senator Mike Lee (R-Ut.) and Representative Chris Stewart (R-Ut.) said the Republican presidential nominee should drop out of the race.